We now estimate that every star in the galaxy has at least one planet, but that is leaving aside the potentially billions more planets that were ejected from their solar system and are now hurtling through the universe all alone. One possibility is stars literally pushing the planets into interstellar space after the suns reach the end of their normal hydrogen-burning lives and begin expanding into red giants. Other scenarios involve gravitational perturbations, either caused by passing stars, a solar system entering and exiting our galaxy's gravitationally dense spiral arms, or even via interactions with dense molecular clouds. For more, check out ScienceNOW. The original paper, which will appear in Monthly Notices of the Royal Astronomical Society, is available here. 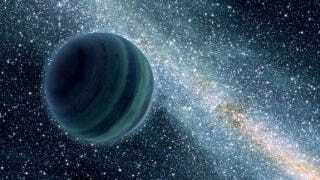 Artist's conception of rogue planet via NASA/JPL.